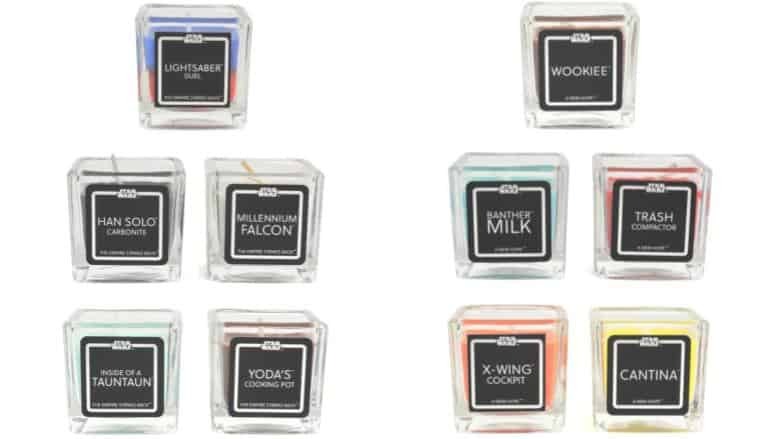 Star Wars Candles Available For Preorder Now | Nerd Much? Need the scent of adventure inside your living room? Or maybe the smell of wisdom, emitting from the one and only Yoda? Now you can with these Star Wars candles by Numskull Designs. The entire series is focused on the original trilogy, which includes The Empire Strikes Back, A New Hope, and Return of the Jedi. The Empire Strikes Back set of candles includes Lightsaber Duel, Han Solo Carbonite, Millennium Falcon, Inside of a Tauntaun, and Yoda’s Cooking Pot. Merchoid does not provide any information regarding the smell of each candle, if they smell at all. All they have are puns and quips referencing the title of the candle. As such, buying these candles are a bit of a gamble. If Han Solo Carbonite really does smell like carbon (which is scentless) then it is a pretty lackluster candle. And let’s hope that Yoda’s cooking is as good as his skills with the lightsaber. The Empire Strikes Back set goes for $44.99 USD for pre-order right now, to ship November 2018 and shipping is free. That is to say nothing of what a lightsaber duel is supposed to smell like, other than burning metal and sweat. Hopefully, all of these candles smell like something slightly more exciting than vanilla and actually envoke memories of the original trilogy. The A New Hope candle set includes Wookiee, Banther Milk, Trash Compactor, X-Wing Cockpit, and Cantina. Once again, the descriptions for these candles do not inspire confidence that they will smell any good. For example, Wookiee is described in a question as “ever wondered what a walking carpet smelled like?”. As someone who has encountered the cosplay of Wookiee, I can tell you it is thoroughly unpleasant – 10/10 do not recommend. The best description will have to go to Cantina, however, which is supposed to smell like “eau de scum and villainy.” What could possibly go wrong? Last but not least, is the Return of the Jedi set which includes Rancor, Sarlaac Pit, Jabba’ Palace, Ewok, and Death Star Destroyed. None of these names or descriptions are better than the last two sets, but at least Death Star Destroyed might smell like victory. Or whatever saving the galaxy smells like. You can buy each set individually for $44.99 USD, or you can get the special edition version of each for $62.99 USD. The special edition comes with a candle holder for all five candles in the set. You can also purchase all three sets for $134.97 USD, currently on sale for $106.99. Or the special edition of all sets for $188.97, currently on sale for $142.99. Want more cool Star Wars Stuff sent directly to your inbox? Sign up for our weekly newsletter here.